On a windy weekend afternoon on March 16, the Golden Rams opened up conference play with a decisive 17-3 win over Slippery Rock. Ranked fourth in the country, West Chester netted four goals in the opening 10 minutes and never looked back. In a game that saw contributions from up and down the roster, junior Tatum Altman (North Brunswick, N.J./North Brunswick) enjoyed a six point afternoon. Tallying four assists to go along with her two goals, Altman is looking to build on her All-Atlantic Region second team sophomore season. Nine days prior to their tie with Rock, the Golden Rams suffered an emotional overtime defeat at the hands of the reigning national champion, Le Moyne College. Despite the negative result, Coach Ginny Martino was very optimistic after the game. In their most recent tie with Kutztown on March 19, the Golden Rams dominated the Golden Bears of Kutztown by a score of 15 to 6. Ryan McKinney, a transfer All-American from Division II powerhouse LIU-Post, set the tone early with four goals in the opening 10 minutes. West Chester has responded greatly to the early season adversity, defeating their last three opponents by an average margin of 13 goals. 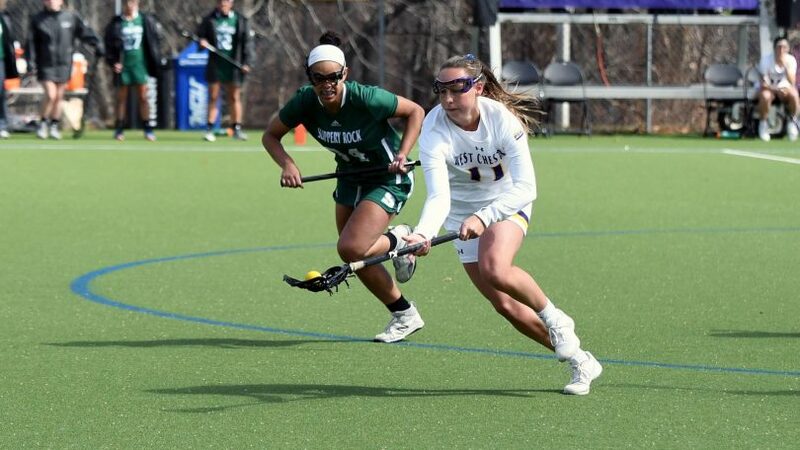 The Golden Ram attack is in safe hands, as All-American returnees Sami Barnett (Glenolden, Pa./Interboro) and Maggie Stella (Doylestown, P.A./Central Bucks East) look to place an exclamation mark on their senior campaign. Barnett was also asked if there is a bit more urgency to execute and perform, she reaffirmed the mindset of the Golden Rams as the season hits its stride. West Chester hosts Pace University in a non-conference matchup on Thursday, March 21. Following their game against Pace, the Golden Rams travel across the state to take on conference foe Seton Hill on Saturday March 23 in Greensburg.